McClatchy is a behemoth in the news world, operating 30 daily newspapers in 14 states, plus a Washington, D.C., bureau. With an average weekday circulation of 1.6 million the company spans coast to coast, featuring properties like The Raleigh News & Observer, The Sacramento Bee, The Charlotte Observer and The Fort Worth Star Telegram. McClatchy properties are iconic in their respective markets. But to win on social media, these brands have faced stiff competition from national news outlets and even better-resourced TV networks. How should local news use CrowdTangle? 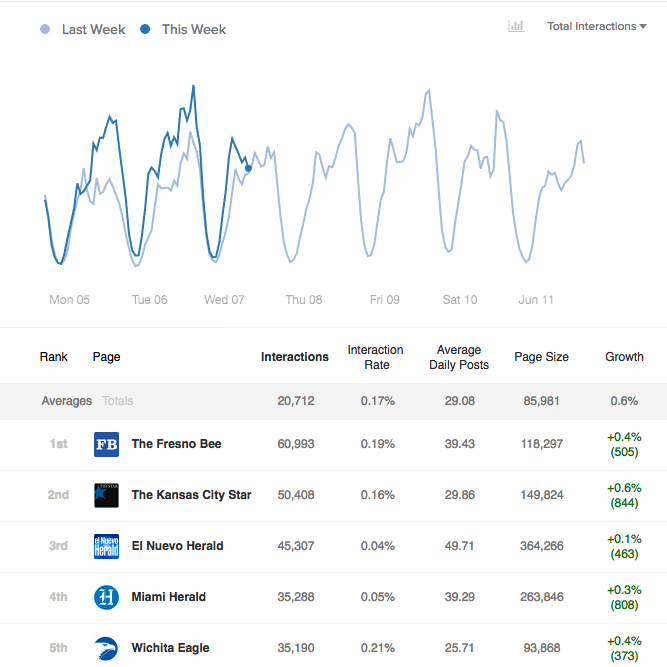 As a publishing company, McClatchy’s competition, size, and distribution present unique challenges when forming effective social media strategies. McClatchy’s social media director, Jessica Huff, is leading this charge. She oversees the social media strategy of more than two dozen outlets and is tasked with growing readership across the country, via social media. Her sidekick in all of this? CrowdTangle. Here’s how Jessica and McClatchy use CrowdTangle to help drive their social media. Pulling audience engagement data can be a real challenge, no less when you’re managing huge numbers of owned accounts (and their gobs of data). CrowdTangle dashboards add simplicity to the job. “[With CrowdTangle] it’s really easy to keep an eye on what the newsrooms are up to each day,” Jess says. McClatchy’s Real Time Team — a special ops social news group — uses CrowdTangle’s viral alerts to track trending news among competitors, so they can see what’s performing especially well for them both within and outside of McClatchy’s own markets. They do this using CrowdTangle overperforming feature, which can track trending content across local, national, and international news sources. “We’ve picked up high-performing stories among our competitors, and taken our own spin on them,” Jess says. 3. Big picture insights. The heavy stuff. How does CrowdTangle play into the broader picture? The McClatchy team uses CrowdTangle’s historical data feature to reach back into the archives and find common beats and topics that have overperformed and underperformed for her papers. These learnings get packaged and sent down to her local social managers, so that otherwise forgotten victories on social turn into repeat success. CrowdTangle provides monthly reports to Jess and her team, and they use those to gauge how local markets are doing against each other and their competitors. Jess will then use those reports to set goals among newsrooms to hit above the company average. From there, CrowdTangle helps to address much bigger question marks for the McClatchy organization. Jess says the discussions around what works and doesn’t on social “play into the larger question of informing our beat choices in our newsroom.” Social engagement can demonstrate to strapped outlets which beats are naturally drawing in readers from social media platforms, and which aren’t.